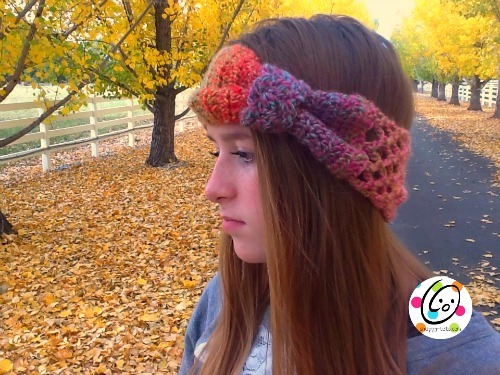 This DIY Crochet Headband is a perfect way to warm your ears and style your hair! This is thoughtful handmade gift for the teen on your list! It’s perfect for those cold winter days when you are in a hurry! Crochet gifts I think are the best gifts! If you get started now you can have a handmade holiday. Most Sunday mornings I like to pull my hair up, rather than spending a lot of time on it. I wanted a headband that would be light enough to wear year round and could be worn with anything. This band is thinner than most, with a lattice look around the sides and bow in front. This is designed to match my Sunday Mornings Scarf. Yarn: worsted weight in choice of color. Sample was made from Red Heart Boutique Treasure Abstract. Finished size: 5.5-7” wide x 40” long. Can be made any length. 2. This step creates a button hole. Ch 1, turn, sc 3, ch 2, sk 2, sc 3. 3. Ch 1, turn, sc 3, 2sc in ch space, sc 3. 8. Ch 1, turn, sc in each st to end of row. 10. Ch 1, turn, sc in each st to end of row. 17-30. Ch 2, turn, hdc in each st to end of row. 38-39. Ch 1, turn, sc in each st to end of row. 41. Ch 1, turn, sc in each st to end of row. 43-44. Ch 1, turn, sc in each st to end of row. Button: with sewing needle and thread, sew button to end of band without button loop. 2-9. Ch 2, turn, *sk 2, (sc, hdc, dc) in next st*, repeat once. Finish off, leaving a tail for sewing beginning and end edges together. Wrap loop around middle (hdc rows) of band. With yarn needle and yarn tail, sew short ends of loop together. I hope you enjoyed this pattern. 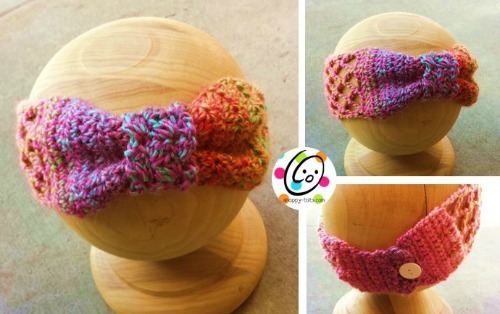 I started my shop, Snappy Tots, in 2010 and have over 340 crochet and knit patterns (free and paid). Bright colors, happy crochet and a touch of quirkiness describe my style. Beautiful headband & cool blog. So glad Snappy Tots sent me here. Going to follow for sure and just signed up for email updates.